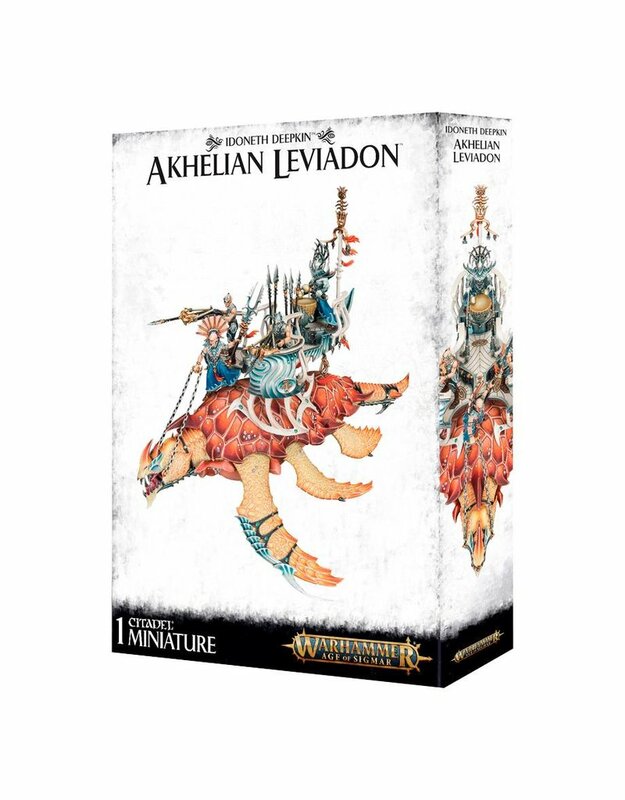 Components necessary to assemble an Akhelian Leviadon. A large centrepiece model, it looms large above the Thralls and Reavers of an Idoneth army. 6 fins, 3 either side, propel it through the phantasmal seas; the frontmost pair of these are fitted with segmented blades, with the others featuring smaller but equally effective spurs, and each pair – along with the tail section, also fitted with piercing spurs – can be modelled in differing positions allowing for the illusion of flowing movement. Its head features an aggressive profile, with horns and spikes (and the option of a closed or open mouth), but the most notable feature is the blinders and chains – this beast is enslaved to the Ma’harr who stands to the front of the howdah, guiding it into battle. 2 crew either side each man a razorshell harpoon launcher and a Void Drummer – whose insistent pounding beat distorts light itself, providing cover from enemy fire – stands at the back.